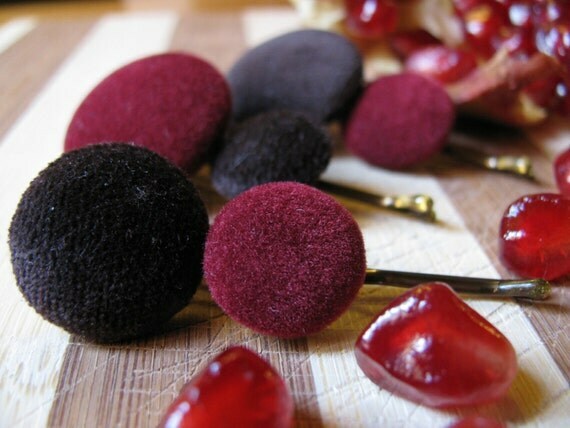 Handmade round velvet buttons on practical bobby pins for a stunning hairstyle look: this is Chocogranate. Be the most original, wear the tenderness of brown chocolate and the soury sweetness of pomegranate...or gift your loved one with this one-of-a-kind present. Chocogranate comes in a set of three bobby pins and it's one of a kind. carine e bei colori, coraggio, riapri e scrivi ti aiutiamo noi!!!! bel lavoro !! complimenti ! I colori sono stupendi! Scommetto che su una bionda stanno una favola!